Most of the armed conflicts in the Middle East go down to religious confrontation. Syria is a glaring example of this. Christians make up around 10 percent of country’s 20-million population. According to the Syrian Patriarch of the Melkite Greek Catholic Church Gregory Laham, 450,000 Syrian Christians have been displaced by the conflict since March 2011. The clerics also reported damage to at least 57 Christian sites since the beginning of the civil war. “Christian communities are constantly being attacked by different Jihadist groups. They loot the churches, burn down the houses, ruin the sites and profane our relics. Their aim is to destroy the Christian civilization in Syria. Islamic militants destroy the cultural and religious heritage of our country. Peace and brotherly unity in which our nation used to live despite the confessional and ethnic differences, is now under threat,” Metropolitan Luka al-Hur said. While Syrian Christians are struggling to protect their relics and simply survive, Russian churchgoers lend a helping hand. In the past few months they have sent $1.3 million to Syria dispatching the money to a Greek Orthodox Church in Damascus to buy basic goods like food, clothes, and mattresses. One of the priests collecting donations is Father Alexander Diaghilev, whose church is just outside St Petersburg, turned to the Bible to explain to his parishioners why they should help the Syrians. “I told them St Paul collected money for Christians in Jerusalem. He collected it in Corinth, although Corinth was in the far-off territory of Greece, quite far from Palestine. I gave people the same reason now: probably you don’t know these people in Syria, but these are our brothers and sisters who are suffering. We have passed through great persecutions and World War II not so many years ago, so many of us remember what that is, or our parents remember how it was. And so we have to help those people who are suffering nowadays,”Father Alexander said. The Kremlin also expressed its support by saying it’s ready to consider a Russian citizenship request from about 50,000 Syrian Christians following the Russian Foreign Ministry publishing a collective request for a double Russian-Syrian citizenship from a group of Christians living in the Kalamoon district. 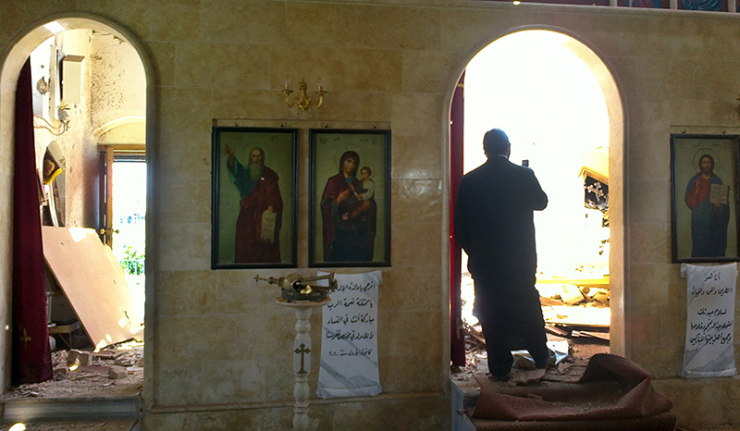 However, the majority of Syrian Christians are determined to stay in the country protecting their heritage even under threat of being physically eliminated by terrorists. Sadly, it means the number of the victims of the carnage is to go up.